Are you looking for creative and memorable end-of-the-year student gifts? How about five days of fun, simple experiences you can surprise your students with, one for each day of the last week of school? Your students are going to LOVE this! On the first day, surprise your students with an invitation to a simple breakfast in the playground, listening to some of their favorite stories... or how about a half-hour outdoors to play with special equipment they never get to use from the gym? 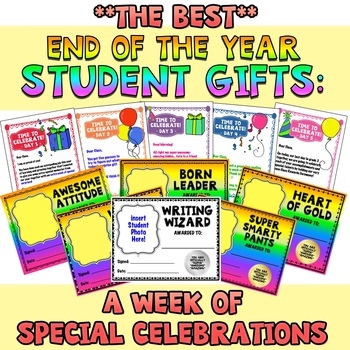 In this resource, I give you five days of special fun and surprises that take very little time or money to prepare - but that end the year in a way your students will never forget - all culminating in a Class Rewards Ceremony on the last day, complete with customized certificates for each student. And if these ideas don't work for you, I offer several more to get your imagination going about what other surprises you might love to give! 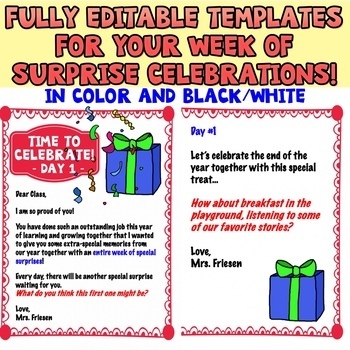 This package includes TEN EDITABLE AND PERSONALIZED templates for a week of End of the Year Celebrations (in color and in black and white), an editable parent letter (for a special experience that invites children to bring their PJs for), as well as 32 EDITABLE CERTIFICATES (in color and in black and white) to give to your students on the last day. You can have students vote on these or choose them yourself. Every award is unique and customizable - you can INSERT EACH STUDENT'S PHOTO right onto each certificate. What a wonderful memory for parents of their child's year! 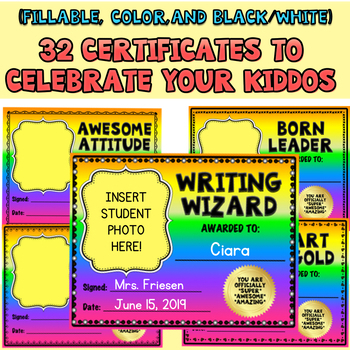 There are 2 VERSIONS included in this package: I've included one PDF version for print & go, as well as a PowerPoint Version, complete with editable text boxes for the student name, teacher name, and date. If you are using the PPT version, just open the PowerPoint file and type in the text boxes. I have also included a template of labels for each of the Award Certificate titles. 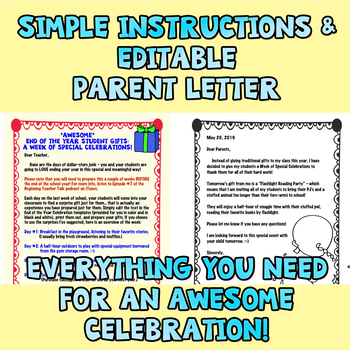 In my classroom, I tape one label to a paper bag for each award, give my students a first-name checklist of their classmates, and let them cut each name out and place in in the bag for the award they feel that student deserves - they just love it! I have also added a list of all the awards if you choose to have your students nominate them.